Pompey are optimistic Oli Hawkins will be fit for face Shrewsbury Town on Saturday. The striker limped out in the first half of last weekend's 3-0 victory over Plymouth with a hamstring injury. 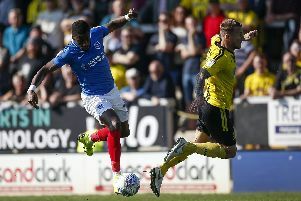 After a scan on Monday, Hawkins was left out of the Blues’ squad for their 4-0 Checkatrade Trophy victory against Gillingham a day later. But the Dagenham & Redbridge marksman trained this morning ahead of the Shrews’ visit to Fratton Park. And boss Kenny Jackett is hopeful Hawkins will be involved in the game. He said: ‘Hawkins trained this morning and looks okay, so I’m optimistic for the weekend. However, Jack Whatmough (hamstring) and Anton Walkes (groin) will miss Saturday’s clash. The pair came off injured at half-time against Plymouth and are both set for a short spell on the sidelines. The manager added: ‘Anton Walkes and Whatmough will take a little bit longer. Pompey will also be without Ronan Curtis against Shrewsbury after he was called-up for Republic of Ireland under-21 duty.